The Front Porch People | "What's New?" 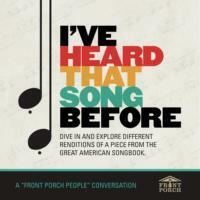 I've Heard That Song Before is a podcast about the jazz standards of the Great American Songbook. In each episode, one song is explored by jazz musician host, Joe Hunter, and his jazz musician guest. You'll hear 4 different renditions of the selected song introduced by the hosts who compare and contrast the merits of each adaptation. At the end of each episode, you'll also get to hear a related bonus song. The easy-going conversational format of the show makes it enjoyable for both jazz buffs and novices alike. Episodes are all approximately 35 minutes. Podcast Summary: Joe and Les cover a charming song from the jazz era, made popular by Bing Crosby in 1939, while exploring four renditions. You’ll hear versions from the talented jazz musician Dinah Washington, a strong vocal performance from Linda Ronstadt, a romantic instrumental version and much more!